The new RHS LS Race Block Belt Drive from Jesel like all their belt drive kits have Teflon-coated high-vacuum seals, externally adjustable cam timing, hard coated pulleys and Grade 8 mounting hardware. As the leader in valvetrain technology and control, Jesel is pleased to announce the release of a Camshaft Belt Drive for the RHS LS Race Block. To work with the RHS 0.388-inch-raised cam tunnel block, Jesel engineered this drive using specifically designed 27mm-wide pulleys wrapped with a patented Gates HTD2 drive belt. 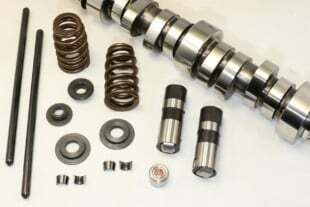 As with all Jesel Camshaft Drives, features include Teflon-coated high-vacuum seals, externally adjustable cam timing, hard-coated pulleys, and Grade 8 mounting hardware.